Please click for a larger image. Original size can be downloaded at deviantArt. Since I've been working closely with the chapters to write The New Trials Chapter Summaries, I felt that it was a project that I could do, and I'm pleased to see that I was right! Another reason why I wanted to have this timeline done was to help me include non-scene-related fanarts to The New Trials Picture Book. It's been so helpful! Overall, it's a lot of fun to see what took place when and to learn that twelve years of our time is currently two years and a half in New Trials time (sort of like Narnia!). Most of the dates are facts (holidays, birthdays, new school sessions) while there were others that I had to guess myself (Fall months for Arc 3!!). Special notes are included to give a sense of what's going on. It's interesting to see how time goes by. In Arc 2, summer lasted for nine chapters while in Arc 4 summer was during the end of Chapters 55 and beginning of Chapter 56! Please click for a larger image. I was always curious to see how the release date timeline would look like. So I made an Excel graph. I used the old Updates page to date back from March 2001 to August 2003, and everything before that I had to wait for teenage Wish-chan to comment about the season in her Author's Notes. Sometimes in her author's notes at the end of the chapters, Wish-chan would comment on how New Trials time would be in sych with real time. 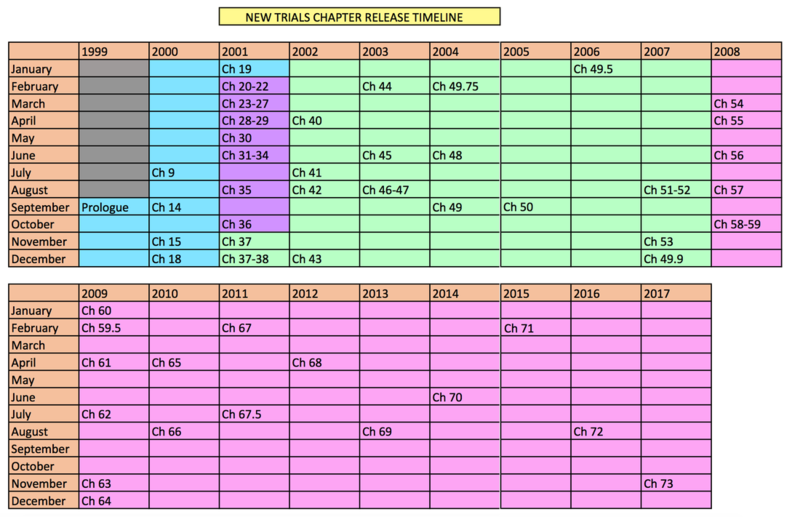 Seeing that the real time and chapter release timelines were done, it was easy to make a comparison of the two to see how many times it happend. Below you will see that dark orange represents when New Trials and real time shares the same month and light orange is just one month off either before or after.